If you’re reading this right now, there’s a better than 50% chance you’ve seen Solo, a “midquel” that takes place between Revenge of the Sith and Rogue One. We’re well into a revival of the series, with at least one more movie continuing the plot of the original, plus a standalone Boba Fett film, plus undoubtedly many more sequels, spinoffs, and tie-ins to come. There’s long been grumbling about oversaturation, but think of it this way: we know the series reached its lowest point a long time ago, early in the game, with the legendary Star Wars Holiday Special. And now, we know that even the rip-offs and “homages” already hit rock bottom, with the 1979 CBS pilot Starstruck. Starstruck starts with a simple premise–-a sitcom set in an environment like the Mos Eisley Cantina–-and almost immediately becomes something so incomprehensible that it feels like English badly dubbed into Swedish, and then badly dubbed again back into English. It would be charitable to assume that it was a series of sample clips cobbled together and accidentally aired as a single cohesive episode, but considering it was written by playwright Arthur Kopit, whose specialty is a sort of genial surrealism (read the baffling Oh Dad, Poor Dad, Mama’s Hung You in the Closet and I’m Feeling So Sad), it’s possible that its off-putting incoherence was intentional. The show is about a family of humans, the McCallisters, who run a space diner/nightclub/hotel sometime during the 22nd century. I know this only because I looked it up online, as the show itself does nothing to establish the setting, who these people are, or how they’re related to each other. There are more than a dozen characters introduced, including aliens, a pair of robots who speak with Irish brogues (because why wouldn’t they? 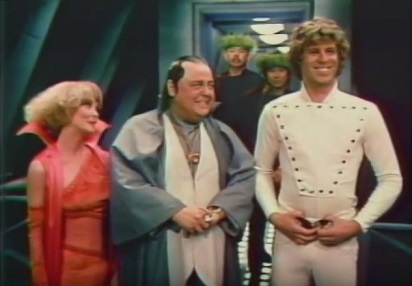 ), a beleaguered talent agent, an aspiring lounge singer, a bargain basement Luke Skywalker, a black bartender, and an assassin who appears to be wearing a shower curtain as a cape. If they were given names at all, I couldn’t remember them by the end of the episode. Names aren’t terribly important here, though, as more than half of these characters are given nothing more to do than stand around and occasionally react to what’s happening. The opening credits suggest that the McCallisters might be time travelers, but nothing comes of it in the episode itself. It would explain why everyone is wearing mismatched clothing, with who is presumably the grandmother looking like Ma Walton, the kids wearing space age jogging suits, and the hero, Ben McCallister (Beeson Carroll), dressed to attend the local Renaissance Pleasure Faire. What the show tries to set up as a potential story arc is dull, what it doesn’t think needs explaining is perplexing–-I spent half the episode thinking the imitation Luke Skywalker was another member of the McCallister clan until he and the McCallister daughter have a romantic moment together. “I wish you hadn’t come,” she tells him, in a line heavy with drama and suggesting that the audience should already be deeply invested in whether these two young people we’ve never seen before should try to work out their differences and fall in love. A brief stab at a plot comes by way of Orthwaite Frodo (Roy Brocksmith), a visitor to the space diner, who is so enamored with the apple pie served there that he offers to buy the whole business from Ben. Ben, a humble salt of the earth type who, despite the 22nd century setting, talks like a character in a 1950s Western, politely refuses. Unable to take no for answer, Frodo calls for his personal assassin, Wilson, because what else would you name an intergalactic assassin? Wilson tries to murder Ben with some sort of floating crystal grenade thing, which Ben deflects with a good old-fashioned, thoroughly 19th century rifle. The episode abruptly ends with the aspiring lounge singer serenading the whole diner with “As Time Goes By” (still a standard more than 200 years from now, evidently) while Ben makes eyes at her. Meanwhile, a canned laugh track is liberally sprinkled over the whole unappealing mess like Bac-Os on a wilted pile of iceberg lettuce. In giving this some additional thought, despite Arthur Kopit’s propensity for deliberate weirdness, I don’t think anyone involved in the making of Starstruck set out to make it purposely unintelligible. Rather, it reads more as if Kopit wrote scripts for several episodes, which were then run through a shredder and random strips and scraps pasted together as a whole new script. It’s a clip episode for a series that hadn’t aired yet, with far more time devoted to reaction shots from random characters than developing any of those same characters, so it’s not difficult to see why TV audiences didn’t demand more where that came from. What is puzzling is how many people must have looked at the final product (which, let me reiterate, does nothing to establish the plot or characters, and just ends with a musical performance) and said “Yep, this is good. Not a thing needs to be changed. Take it to the head honchos, this is going to get a three-season order.” Mind you, I don’t know that that’s exactly what was said, but I always assume that conversations between people in the entertainment industry often involve the phrase “head honchos.” Beyond that, at least one head honcho had to have viewed this, a pilot written and directed by people who had no idea how a pilot works, and thought it was ready to be aired in a Saturday night time slot. Granted, it aired in June, which for network TV is like putting out a plate of nachos after your Super Bowl party is over, but the fact that Starstruck was aired at all is still remarkable. Then again, my lack of understanding of these things might be why I only write about the entertainment industry, rather than work in it.